Floor NU P.A. 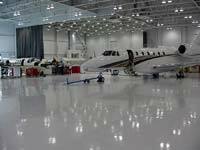 (Poly Aspartic) is a two component high solids (86 percent solids be weight), zero VOC's, aliphatic poly aspartic coating designed for concrete, wood and steel surfaces in food processing facilities, aircraft hangar flooring, cold room floors, maintenance areas and industrial shop floors. Product has a cure time of 45 minutes and is engineered to gel in 15 minutes in order to optimize leveling and wetting properties. It can be applied at temperatures ranging from 40-110F (4-43C), and features chemical resistance, water insensitivity and UV resistance across a wide range of temperatures. When fully cured, product has a glossy, smooth finish. Aggregate can be broadcast into this product to provide a non-skid surface.